When if comes to the offline activation process you need to generate in the process a code that is called the Installation ID but also known within the Support Teams as Locking Code. To generate this code you usually need to open the Locking Utility (wechoid) that you can find in the Windows start menu. Download the *.zip at the bottom of the post or click here. Unzip the content on the machine the SDL Licensing Server is installed and run the LockingCodeGenerator.exe (preferable with administrative rights) on the machine where the SDL Licensing Server Manager is installed. 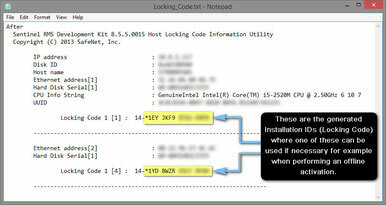 After some seconds the Locking_Code.txt is opening in Notepad automatically and you can see 1 or more available Locking Codes (Installation IDs) that can be used. Note 1: Preferable use the first Locking Code listed but others work too. Note 2: After the report is generated and opened in the Text Editor you can to save it to a location of your choice for future reference during the time of generating the information..
By default the locking code(s) / Installation ID(s) are generated based on the Disk ID and Ethernet address values and are displaying as seen higlighted in the screenshot.